Spending time with my family in France this summer translated into baking a lot of fruit tarts. I can see this is a food habit deeply anchored in my upbringing. And at this time of year, we had gorgeous local quetsches and mirabelles to enjoy. 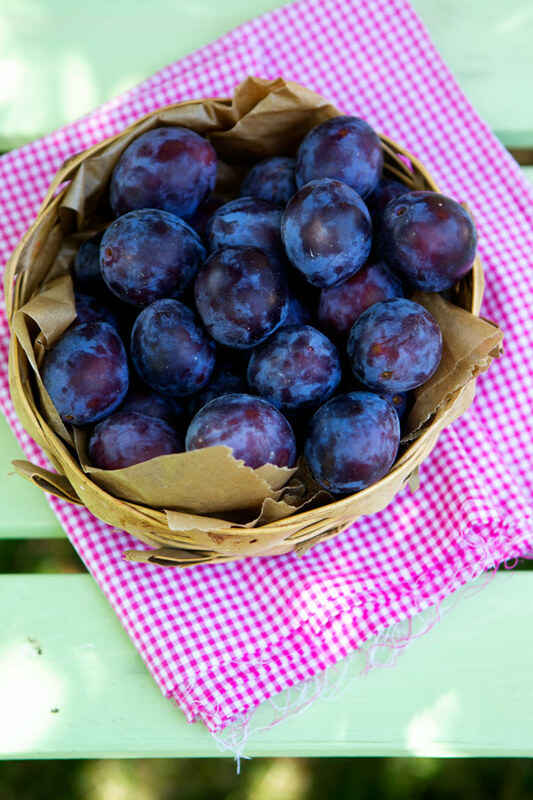 I fell in love with quetsches and mirabelles and Reine-Claude–all varieties of plums–many years ago in my grandfather’s and uncle’s orchards in northeastern France, when I was still a young girl. 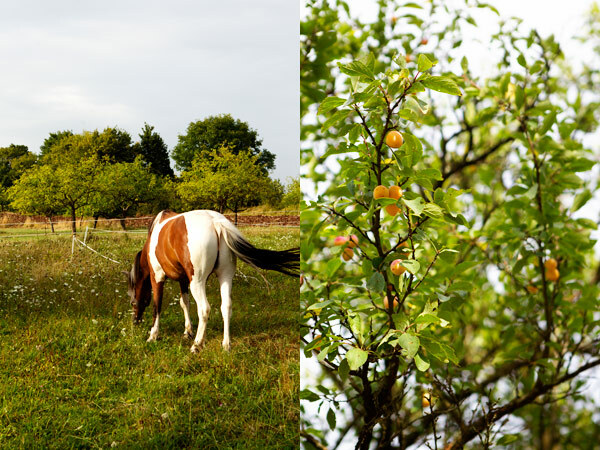 These local plums are a big part of what a French summer spent in Lorraine in late August means to me, when the fields have just been harvested, and hay balls and bundles of straw cover them. Oh! the silly games my cousins and I used to have there in the fields and barns filled with hay. And how fun it was this time for me, to relive these moments with Lulu. When my high school friend R. and her twins came to visit us, we could not help but find a field. And then play. Covered in hay. My grand-father and many of my uncles on my father’s side were farmers. 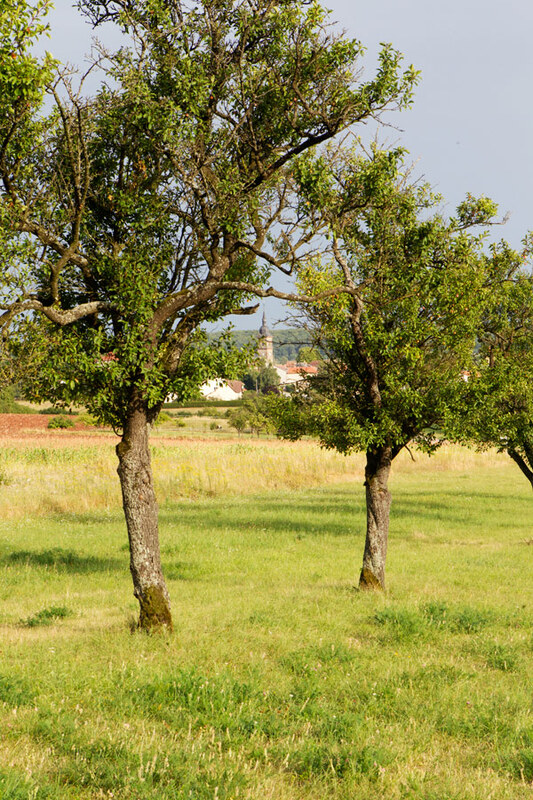 On their land, there were always quetschiers or mirabelliers (the fruit trees) that gave fruit in abundance every summer. At the peak of the season, the kitchen bubbled with activity behind the stove. My mother, grandmother, and aunts skillfully worked with the fruit to make jams, liqueurs, and fruits au sirop. It was a time when a freezer was rare, and they’d naturally prefer to preserve. And then they also baked a lot of tarts with the fruit. The chance that a fruit tart was going to be ready on the kitchen counter was high. I almost took it for granted that it was the way it should be. Waiting for unexpected guests to stop by and enjoy. I felt lucky when I was one of them. I’ve never found mirabelles in the US, but I’ve seen plums similar to quetsches. Here, they are sometimes called Italian plums, although I’ve seen many different names–which always confuses me in a way. Why two names for the same thing? I cannot help but wonder. They are in season right now, and I was delighted to find some at a local market near us. So naturally, I followed our tradition. And I baked a tarte aux quetsches. 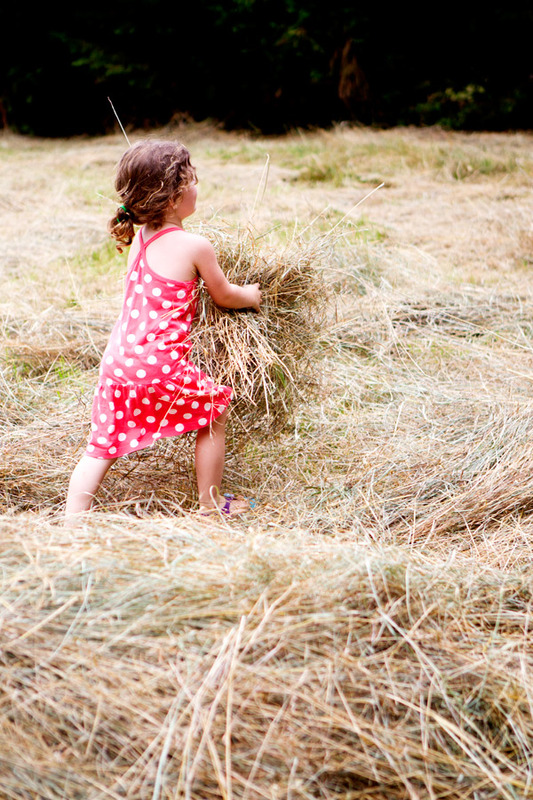 To prolong the feeling of our time spent playing in the hay and enjoying picking the fruit right off the tree. At home, we prefer most of our fruit tarts lightly sprinkled with sugar, and hardly nothing else. My sister-in-law masters them beautifully. 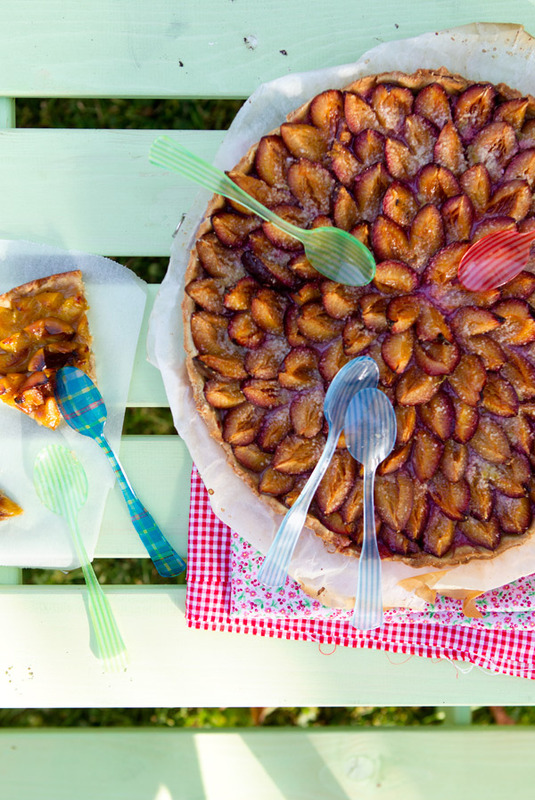 You can make this tart with mirabelles in the same way. In the bowl of your stand mixer, combine the flours, salt, and xantham gum (if using). Add the butter and work on medium speed until crumbles form. Continue by adding the egg yolk. Gradually add the water and work the pastry until it detaches from the bowl. Roll the pastry and garnish a 12-inch tart mold. Make small holes with a fork and place in the fridge, covered, for an hour minimum (or more). Half the quetsches (or mirabelles) and remove the pit. Make a small slit at the top of the fruit without cutting each half completely. In a bowl, combine the sugar, vanilla seeds, lime zest and almond meal. Sprinkle 3/4 of it on top of the pastry. Arrange the fruit on top, and add the rest of the sugar mixture. Bake the tart for 30 minutes, or until the crust is light brown in color, and the fruit is juicy. Remove from the oven. Sprinkle with 2 tablepoons sugar. Let completely cool. Holy geez! I’m making a trip to the store tonight so I can make this tomorrow! Oh this sounds wonderful! I’ve been enjoying lots of tarts lately as I want to eat peaches, nectarines, plums and other stone fruits in all different forms. My granny in Southern Germany always makes a wonderful “Zwetchgendatchi” (sheet cake) using what you call quetsches. Oh, those tarts look all so tempting! The word quetsches tickled my curiousity, It sounds like the German word for these plums, Zwetschge. Your tarte aux quetsches looks like a flower! A big, delicious bloom! We are struggling for fruit in Wisconsin thanks to a frost that nipped many buds. It is the season when one wants plums and apples and pears. Looks like a great alternative for the yet mentioned Zwetschgendatschi! I’m waiting the whole year for this time, when the Zwetschgen/quetsches are ready for baking or cooking jam. Here in Bavaria you get Zwetschgendatschi in every bakery and everyone’s baking it and brings it to parties or for coffee. I was kind of fed up, so I baked a tarte as well. But this recipe looks much better than the heavy one I had last year with eggs and cream on top of the Zwetschgen. Need to try that this season, thanks! Oh, how I love French pastries especially the tarts!! I ate tarts everyday – apples, cherries, apricots, peaches and pears. My favourite is the apple tart! I bought mirablelles, reine claude, peaches (+ roast chicken thigh – cuisse de poulet), salmon quiche from the market for my picnics daily. On my last day in Paris, I bought some mirabelles & riene claudes to take home to Malaysia but some of the riene claudes burst – don’t know whether it was because of the cabin pressure or what. I know I will be busy trying to reproduce those tarts that will linger in my memory for a long time of the lovely Parisian tarts! I am going to make your version. It looks delicious and yummy. Minha sobremesa preferida são as tortas de frutas, de modo especial as francesas. receitas simples, mas de sabores inigualáveis.! Aww. This tarte makes me miss my mother who was German and called this a “quetsche-kucher”. She made them often in the summer and early fall. I’m going to make one this year for Rosh Hashanna….in her memory. Thanks for the reminder and the fond memories. Moi, Québécoise, je n’avais vu des mirabelles que lors de mes voyages en France. Quelle fut donc ma surprise d’en retrouver à mon marché local la semaine dernière! J’en ai pris un panier et j’en ferai une tarte aujourd’hui. Merci pour ces belles photos qui me rappellent la Lorraine de ma naissance. Il y a quelques annees, j’ai vu des mirabelliers couverts de fruits dans un parc de Californie ou nous faisions du camping. Oh c’est vrai, il y en a (des mirabelles) au Québec et en CA? Il faut que je trouve cela!!! Let’s bury mommy in the dry grass was my favourite! 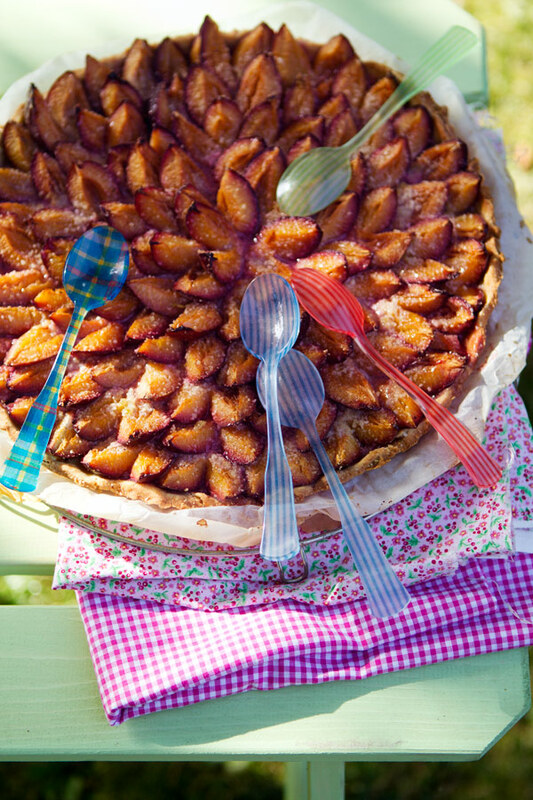 And then go in and circle the table and spoon our the plum tart together…. dipping down our chins and laughing and sticking dried grass to our gooey faces… somehow, I can see it all! 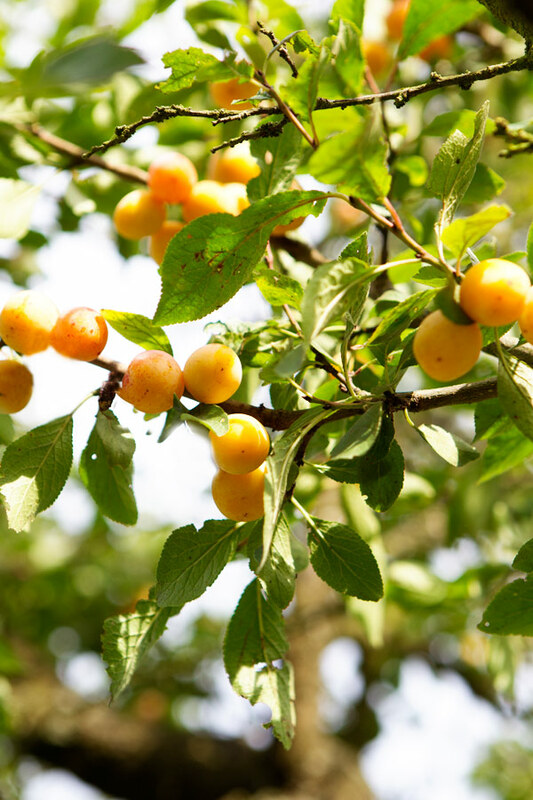 How lucky to have mirabelles growing and ready to pick! My first baking ever as a kid – maybe 10? 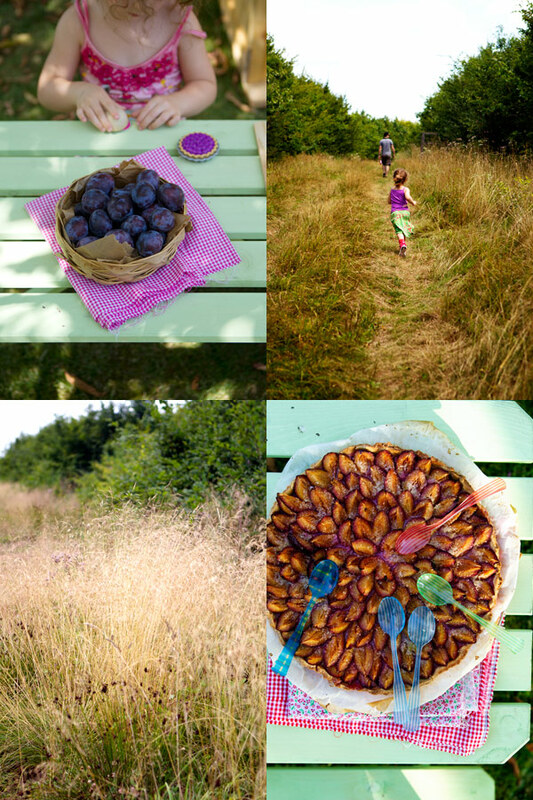 – was a plum tart with fruit from the tree behind our house. A great way to begin! In the US there are so many names for fruits and etc, because we are a melting pot of cultures from around the world, and so young as country – one name has not yet had time to establish itself, and might not ever! Part of the charm of such a dynamic country. a beautiful post! 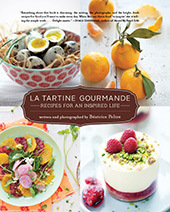 what lovely recollections and recipes! Thank you! This tart looks wonderful! I can;t believe I haven;t made a single fruit tart this summer! Unless you coun fruity pizza… but no, I need to make this ASAP! Totally delightful!!! Food and Lulu getting SO big!!! thanks. there is an italian plum tree just down the street from me! its owners are letting the fruit drop and rot on the sidewalk…maybe they’ll let me have some of it. i love their brilliant blue color. This is my first time posting. 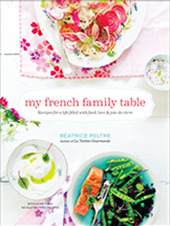 I have been a huge fan of your food, photographs and entertaining dialogues. I decided to stop just reading and saying to myself how wonderful this site is and sharing it with friends and send you a personal note of my appreciation for your creative talent. Merci Bea pour la lorraine!!! 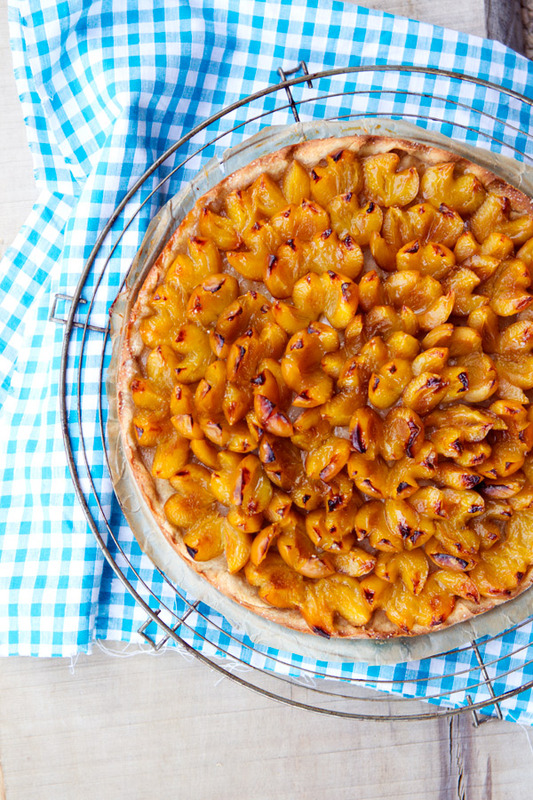 Beautiful pictures, and this pie looks delicious ! Magnifique ! Sur le Marché Jean Talon, à Montréal, une petite mamie vend, en ce moment, des mirabelles. Qui me rappellent tellement mes étés chez ma grand-mère, dans le Maine et Loire!! J’ai soudain envie de crumble aux quetsches ! Je me doutais que tu étais Lorraine, de quel village es-tu originaire ? Peut- être qu’on est du même coin toutes les 2 ?! What a lovely summer you’ve had! So nice to be able to experience the things you experienced as a child with your own child…sharing the memories and making new ones! And of course, with gorgeous, delicious tarts! Nous avons essaye cette recette hier soir (comme plusieurs autres du site et du livre auparavant). Le resultat: il n’en reste qu’un tout “petit” morceau et seule ma bonne conscience me dit de ne pas y toucher tout de suite. A la sortie du four, le melange de sucre etait toutefois tres liquide et c’est en passant plusieurs heures au refrigerateur que le tout s’est solidifie. Peut-etre aurais-je du laisser reposer la pate plus longtemps dans le refrigerateur (je n’ai pas eu la patience d’attendre)? PS: Nous avons egalent A-D-O-R-E le crumble aux abricots-fruits rouges (je l’ai fait 3 fois depuis publication) Merci pour toutes ces bonnes choses! I just tried making this tart and it turned out great. Thanks for sharing! Hummm, ça à l’air délicieux ! Bea – ce n’est pas facile en effet de trouver des mirabelles aux USA. Mais Raintree nursery en vends des plants. Peut-etre en planterez vous pour creer encore plus de souvenirs pur vos enfants? 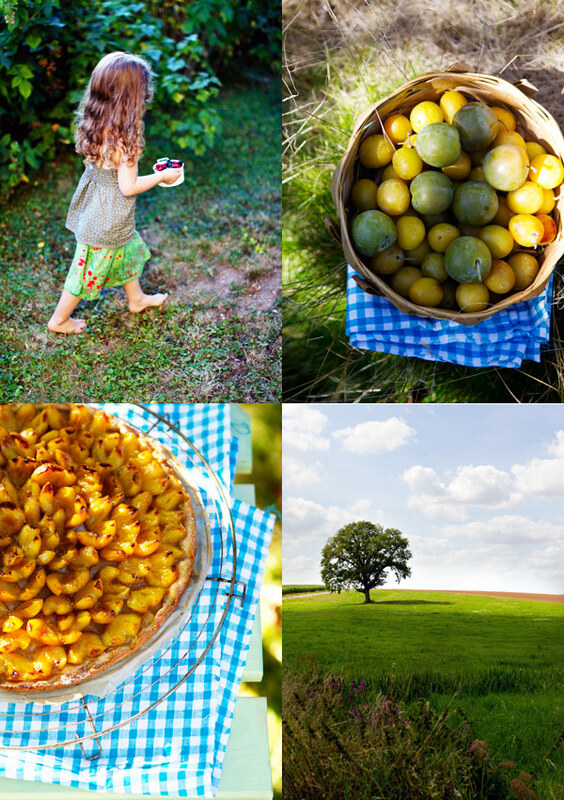 I was hopping for mirabelles this summer when I was in France, but they had not started yet. Reine -claudes are not that easy to find on the market either. SO I think – like curants – I’ll have to grow my own. S’il en reste une part, je prends. Hi, Béa! This plum tart looks scrumptious…I loved it! I also loved the spoons shown in the first picture. I hope you do not mind that I ask you…Where did you buy them??? I am glad that you went back home and enjoyed the time spent with your family. I always have a lot of fun when I go to Brazil as well. Precious memories are made for sure. Wishing you a very Merry Christmas!